In an effort to keep up with what the Steelers are doing amongst the undrafted free agents we'll be linking to media reports about players who have been signed. This posting will be updated as developments warrant. Update: In response to some requests we are adding height, weight, and 40-yard dah times wherever possible. 5'9 6/8", 174 lbs., 4.55 seconds -- Ourlads sees him as having kickoff return potential. We've been concerned about the possibility of a player's strike in the NFL for awhile now; and it appears that we now know what one of the core issues will be in the upcoming death match: a rookie salary cap. On the day after the NFL draft concluded commissioner Roger Goodell went on ESPN radio's "Mike and Mike" show and told the world that he is "a big fan of the rookie salary cap." Then two days later Pro Football Talk alerted us to comments by Patriots' owner Robert Kraft, in a piece by Mike Reiss of the Boston Globe, that "[i]t's kind of nuts that you pay draft picks in the top 10 as if they were free agent veterans on their second contract and have been to a Pro Bowl." "I think that it is very much in the best interest of our veteran players, being able to be rewarded for what they achieve on the NFL field, and to the kind of money that's being guaranteed for rookies that have not played – there's still a question of whether they can play at the NFL level. That's something that I don't think is appropriate, and I think it's one of the things that we've already outlined with the union that we want to discuss and reevaluate it." "We've suggested to the Labor Committee and the commissioner that we scale that back and take that money and give it to the veterans. We're still going to spend the money, [but] we think it's a misallocation of resources and actually can cause problems in your locker room when a young guy who has never played a down is getting paid more than some of your vested veterans." "The point here is that if a rookie in any other profession could step on the scene and make more than someone with a proven track record, the business would turn upside down. Imagine a first year staff accountant making more money than a senior partner simply because his 10 key skills were top in his class. This is basically what's happening in the NFL. Players are making money simply based on the number they were taken. Something with this system needs to change." Creating a schism amongst the players on this issue won't prove to be much of a challenge for the owners; and what happens then (can anyone say "decertification"?) is anyone's guess. Just who is Rashard Mendenhall? Heading into the 2007 college football season not many could have answered that question -- or would have bothered. However, now that he is a member of the Pittsburgh Steelers, well, let's just say a whole lot of people care. With that in mind we did a little digging and came up with a nice piece by Terry Bannon in the October 17, 2007 edition of the Chicago Tribune that gives us a glimpse into just how central Mr. Mendenhall's family is to him. How central? Well, his mother quit her job and moved from Chicago to Champaign in order "to be near her football-playing sons just as Rashard took over the starting tailback job." Not "son," "sons". It turns out that Rashard's older brother, Walter, was recruited by a number of schools when he was a high school senior. At the same time Rashard was also being recruited, so what did Mrs. Mendenhall do? "We narrowed it down to three schools, and then I asked the coaches to take them both. It was important to them to be at the same school. They looked at film and offered both of them [scholarships], per my request." One of those schools was Illinois -- Walter enrolled and promptly redshirted, and Rashard graduated from high school early and joined his older brother. Their mother (Sibyl) and sister (Vanessa) joined them in Champaign last summer (according to the article Mr. and Mrs. Mendenhall are divorced, and Mr. Mendenhall lives in California). The guess here is that the Mendenhall clan will be arriving in Pittsburgh, all together, any day now. Some of us are a bit concerned about the decision by the Steelers to choose an offensive lineman, namely Tony Hills, who suffered a fracture of the left leg in November 2007 and hasn't played since. And our concern isn't exactly allayed by a story from the October 4, 2006 Houston Chronicle that tells the story of a devastating injury that Mr. Hills suffered to the lateral collateral ligament in his left knee in high school. The article tells us that Mr. Hills made his recruiting visit to the University of Texas in a wheelchair, and quotes his mother as saying that his "doctors told him to hang up his cleats . . . [t]hey told him he would do well to gain some functionality [of his leg]." "[t]he search led to Dr. Bruce Moseley, an orthopedic surgeon who has treated the Rockets and Comets. The first surgery to repair the knee ligament was routine, according to Moseley, but after several months the nerve showed no improvement. During that time, Hills had to overcome a condition known as drop foot, which is a paralysis of the foot. Hills' left foot hung down with his toes pointed to the ground, and he couldn't bend the foot at the ankle. Nine months after suffering the injury, Moseley, with the assistance of Houston nerve specialist Dr. Rahul Nath, performed a second surgery to remove scar tissue. The doctors originally planned to take a nerve from another part of Hills' body and graft it to the damaged nerve to see if it would work again as 'a last-ditch effort,' Moseley said. During the second procedure, Nath removed an area of scar tissue about 6 inches below the original knee injury. Hills' foot moved for the first time in nine months. 'We went from telling him before the surgery, "We hope this works, but we're not overly optimistic," to telling his mother he had a chance for a full recovery,' Moseley said. 'It was really miraculous.' "
Certainly the story is a testament to the perseverance of Tony Hills, and he's to be admired for that. However, isn't there/shouldn't there be just a little bit of concern amongst the Steelers' brain trust? According to one published rport Drew Radovich was one of ten players signed undrafted free agents by the Minnesota Vikings. And according to another Eric Young was signed by the Browns. Indeed there has been a flurry of activity by a number of teams, and until the dust begins to settle it will be unclear just who's left to (at a minimum) fill out the roster for training camp. The feeling here is that the Steelers' brain-trust did an excellent job early on of responding to the realities of the draft (i.e. the rapid depletion of offensive linemen well before pick #23 rolled around). To underscore that point one need only look at the pre-draft rankings by Pro Football Weekly of the top 150 players available. Despite picking late in each of the first two rounds the Steelers were able to get two top twenty players (Rashard Mendenhall, #13 and Limas Sweed, #19). And as a UCLA alum I am thrilled that the Steelers brought Bruce Davis into the fold in round three -- he is going to make a contribution, including on special teams. However, three of the final four choices made by the Steelers were of players who are either coming off significant injuries or have had injuries of one sort or another during their respective college careers. Tony Hills, at 6' 5 1/8", 309 pounds, is a big man but according to Ourlads Scouting Service he is "more athletic than powerful." There are worse things to be, but the knock on this converted tight end has been his poor technique. He may end up as an offensive tackle, but will probably play on the right side. Of course he also broke his left fibula in the game against Texas Tech in November. Dennis Dixon was one of the most electric college football players to come along in quite awhile. A legitimate Heisman Trophy candidate before tearing up his ACL -- he actually played on that injured knee against Arizona for about a quarter -- he has been compared by some to Vince Young, but Mr. Dixon is already a better passer than Mr. Young. However, as good as Mr. Dixon might become the Steelers could have addressed their offensive line needs with Roy Schuening, a guard from Oregon State who Ourlads rated as the #2 guard available, and who was chosen by the St. Louis Rams with the pick immediately after Mr. Dixon was chosen by the Steelers. In round six the Steelers made their final two selections -- Mike Humpal, LB, Iowa and Ryan Mundy, FS, West Virginia. 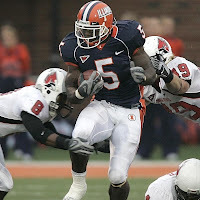 Mr. Humpal missed playing time in 2003 and 2006 due to nagging injuries (back and knee sprain), but was productive over the course of his last two seasons (172 tackles in 24 games). Additionally, Ourlads is complimentary of his skills and potential: "Instinctive and hard working . . . [g]ood football intelligence, competitive, and active." Think a younger version of Clint Kriewaldt. As for Mr. Mundy, his is an interesting case -- he actually played for three years at Michigan, graduated, began graduate studies at West Virginia, and with a year of eligibility left he played for the Mountaineers. He has good size, 6' 1", 215 pounds, and was timed at 4.55 seconds in the 40-yard dash. However, the problem with this choice is that once again the Steelers failed to address their need at offensive line -- Donald Thomas, an offensive guard from Connecticut (6' 3 3/8", 303 pounds), described as "a good athlete . . . [who] flashes an explosive punch" -- was the very next player chosen after Mr. Mundy. Despite doing a good job of dealing with the prevailing conditions of the early rounds the Steelers have taken some chances on players coming off of injuries, and missed a couple of opportunities to select offensive linemen. However that could be rectified if the team acquires some undrafted free agents (a la Willie Parker), and with that in mind here are a couple of suggestions. Eric Young, offensive lineman, Tennessee: Two year starter at tackle who is expected to move inside at the pro level. Pre-draft rankings by both Pro Football Weekly and Ourlads had him as the #8 guard prospect available. Described by Ourlads as a "good athlete that is smart and competitive." Drew Radovich, offensive lineman, University of Southern California: Ourlads says that he "[p]lays with an attitude and aggression." A two year starter at tackle, he projects to move inside in the NFL. Rated ahead of Donald Thomas by Ourlads. There are others out there, but either of these two young men would augment what was a somewhat risky second day of the draft. Every now-and-again things just work out. So it is that in the third round of the NFL draft the Pittsburgh Steelers selected a terrific defensive end, UCLA's Bruce Davis. Though fans of the Steelers may be leery of a Bruin selection (who can forget the disaster that was Danny Farmer), Mr. Davis is a high-energy, non-stop impact player. A leader on the Bruins' defense (the same group that limited USC to seven points in the 2006 game), his performance in the Las Vegas Bowl was amazing for its intensity from beginning to end. Mike Mayock of the NFL Network projects Mr. Davis as an outside linebacker (think a faster, stronger Joey Porter), and Ourlads Scouting Service agrees saying that he "[c]overs a lot of ground in pursuit . . . [g]ood chase speed and flashes a burst in the pass rush . . . [d]isruptive in his play." While he has a great deal to learn about playing the linebacker position this is a player who can contribute immediately on special teams. In round two, after watching Jacksonville beat them to Quentin Groves, the Steelers picked up the tall receiver that ben Roethlisberger requested during the offseason. Limas Sweed, measured at the NFL Combine at 6'3 7/8", missed most of his senior season because of a wrist injury that ultimately required surgery. Beyond that, the general consensus appears to be that while he is a physical receiver he lacks breakaway speed, and is sloppy in his route running. Despite all that was perceived as a first round pick in a few mock drafts. However, given the struggles that most collegiate receivers have adjusting to the pro game, fans should not expect Mr. Sweed to have much of an impact in 2008. All of those players were mentioned in numerous mock drafts as being the #1 pick in the 2008 draft for the Pittsburgh Steelers, but who could have predicted an unprecedented first round run on offensive linemen, not to mention all of the trades in that same round? So it was that, at 5:43PM EDT, the Steelers chose a running back in the first round of the draft for the first time in nineteen years (1989, Tim Worrley, Georgia). As frustrating as it is for fans, Kevin Colbert and Mike Tomlin did exactly the thing that smart, successful teams do -- they took the best player available, and one who was a good value at the #23 pick. According to Ourlads Draft Service Mr. Mendenhall was the tenth best player available (and second best running back), irrespective of position, and Pro Football Weekly rated him as sixteenth best (and third best running back). "Good blocker on blitz pickup . . . [c]an run away from defenders . . . [e]xplosive through the hole to burst up the field. Excellent inside vision and running instincts. Drives legs on contact. Not easy to bring down. Strong lower body." At 5'10', 225 pounds he is the right height, but a little light. So eat up Rashard, and hit the weight room -- all the fans our hoping you're our new Bus. The rumors and conjecture about the upcoming draft, already white hot, will ascend to the level of "breaking news" for fans everywhere; and Pittsburgh Steelers Fanatic isn't any exception! Reportedly moving up is Jerod Mayo, he of the "uses his body as a weapon" comment from Ourlads Scouting Services, is now "warranting top-15 consideration." Conversely Malcolm Kelly, the wide receiver from Oklahoma, "[h]as been removed from many teams' draft boards because of his two bad knees, one of which has been reconstructed and the other in which he has arthritis. Questionable work ethic, attitude and intelligence will not make it easy to invest heavily in him. Teams that buy the hype and think he is a great value in the second round could be disappointed. Has big-time bust potential at a position where there is a great tendency to bust." Mel Kiper is the best known of the "draft experts," but another who has gained a loyal following is Mike Mayock of the NFL Network. Mr. Mayock conducted a conference call for the media last week, and several of his comments touched upon players who have been rumored to be of interest to the Steelers. Jonathan Stewart, RB, Oregon: "Jonathan Stewart is . . . a 238‑pound tailback that ran 4.5, highly‑productive, played through pain, through injuries, great balance, stays on his feet through hits. My only knock on him after watching a bunch of tape is I don't see a second gear; I don't see him stick his foot in the ground and all of a sudden accelerate to a different level. I think he's going to be a very good back in the League, I just don't see any backs this year that are anywhere comparable to, say, Adrian Peterson." Branden Albert, G, Virginia: "Branden Albert, the guard from Virginia, has thrown his hat in the ring as a tackle. He could be a top ten pick, and he could jump ahead of Clady and Otah . . . to me, when I put the tape on after he declared as a junior, actually I called Howie Long who I'd known for 30 years and I said, 'Howie, who the heck is this Branden Albert kid . . . I don't know him.' Howie said, 'Do yourself a favor put the tape on tonight. Don't wait. He's the most explosive in space interior line man I've ever seen at the college level.' I put the tape on that night. Howie was right. Kid makes plays, finishes plays in space, he's long, he's athletic, he kicked outside the left tackle two games this year, got better the second game. He's the kind of guy that down the road could be a left tackle. If so, his value will be higher. So, regardless, he's a first round pick as an interior player. If somebody believes he's a left tackle, he'll be a top ten pick." Draft Quality: "Regarding this particular Draft, I think it's real deep, deeper than the last three or four years, through about 75 picks. So if you're picking 1 through 75 and have multiple picks 1 through 75, you're in real good shape. I think it tails off after that, not as strong at the bottom end as it has been the last couple years, and I think in the top 10, it's a very strong class, but I don't think it's got maybe the superstar nature of last year's where you had a Joe Thomas step in, play at a Pro Bowl level, and an Adrian Peterson step in and play immediately at a Pro Bowl level." There are several resources that Pittsburgh Steelers Fanatic leans on pretty heavily -- specifically, Football Outsiders, Pro Football Weekly, and Ourlads Scouting Services. In recognition of that fact we decided to feature their mock drafts in a separate posting, and alert you to an update to Mel Kiper's prediction as well. Football Outsiders: Jonathan Stewart, Running Back, Oregon. The experts at Football Outsiders describe Mr. Stewart as "an elite talent," and "a steal" at the twenty-third spot. Pro Football Weekly: Gosder Cherilus, OT, Bostone College. Currently available only in the print edition of the the magazine, PFW personnel analyst Nolan Nawrocki believes that Mr. Cherilus could be pressed into starting for the Steelers in his rookie season. And in an online article, Mr. Nawrocki tells us that in conversations with NFL personnel people there is a growing belief that Jonathan Stewart will "become the best pro from this year’s draft." Ourlads Scouting Service: Chris Williams, OT, Vanderbilt. In their print Guide to the NFL Draft: 2008 Ourlads rates Mr. Williams as the third bast offensive tackle available -- ahead of both Jeff Otah and Gosder Cherilus. Of Mr. Williams they say, in part, "[c]an deliver an explosive jolt and punch in pass protection. Good arm length and big hands. Eplosive first step into target." Mel Kiper & Todd McShay, ESPN (subscription required): Mr. Kiper: Maclolm Kelly, WR, Oklahoma. Mr. McShay: Kentwan Balmer, DT, North Carolina. We mentioned in our previous post that Mr. Kiper had done a spot on ESPN indicating that Mr. Kelly would be the Steelers' first round pick. We can't say that we are very excited about another first round wide receiver. The time that it takes for young receivers to learn the offense seems reason enough not to choose another -- and given the Steelers' re-signing of Nate Washington it would seem especially ill-advised. As for Mr. McShay's prediction . . . Mr. Balmer seems a bit of a reach even late in the first round. Though he has good size -- 6'4", 308 pounds -- his limited experience (he was a one-year starter at UNC). He is less developed in terms of technique than some who are less physically gifted. Houston: The all-time series is tied, each team having won a single game. In their six previous seasons in the league the Texans have opened on the road twice, and have a record of 1-1 in those games. Baltimore: After being demolished on a Monday night last season the Ravens, who need very little motivation in order to get up for games versus the Steelers, will have all that they could hope for. Previous week's opponent: Cleveland. @Jacksonville: A Sunday night battle. The Steelers are 8-11 all-time versus the Jaguars, 3-7 in Jacksonville. Previous week's opponent: Houston. Bye Week: The Steelers have their bye in week six for the second consecutive season. N.Y. Giants: The champs -- prepare for New Yorkers to sneek across the border. One weekend not to be in the 'Burgh. Previous week's opponent: San Francisco. @Washington: Another new coach in Washington tries to build on, what this time round proved to be rather modest success of, a Joe Gibbs tenure. Meanwhile, the Steelers' overall record on Monday night is 35-22; however their road record on Monday night's is 13-17. Previous week's opponent: Detroit. Indianapolis: The average high temperature on the North Shore on November 9th is 52 degrees fahrenheit, while the record low high temperature is eighteen. Here's hoping for a cold snap. Previous week's opponent: New England. San Diego: The Steelers lead this all-time series with a 19-6 mark, but lost the last meeting between these two teams (October 8, 2006, 13-23). In 2007 the Steelers played two consecutive home games on three separate occasions and were undefeated in those six games. Previous opponent: Kansas City. Cincinnati: As previously noted. Previous week's opponent: Philadelphia. @New England: Though the Steelers lead the all-time series at 12-7, in recent years the Patriots have won the games that mattered most. And while the early part of the Patriots' schedule will seemingly have them undefeated, five of their road games this season are out of the Eastern time zone, and four them are on the west coast (at S.F. and at S.D. in consecutive weeks, then at Seattle and at Oakland in consecutive weeks). Previous week's opponent: Miami. Dallas: When is a young quarterback's third season as starter "make or break"? When he plays in Dallas. The Steelers were 2-0 at home against the NFC in 2007. Previous week's opponent: Seattle. @Baltimore: The Steelers have not won a regular season game in Baltimore since October 27, 2002. Previous week's opponent: Washington. @Tennessee: Since becoming the Tennessee Titans the Steelers have a 3-10 record against this franchise (including playoff games), and are 1-7 playing in Nashville. In 2007 the Steelers were 2-4 on the road versus an AFC opponent. Previous week's opponent: Houston. Cleveland: The 2007 regular season featured a final game against Baltimore; and about this time last year everyone assumed that that game would go a long way in determining the AFC North champion. Previous week's opponent: Cincinnati. Schedule Fun Fact: The Steelers travel out of the Eastern time zone just once during the 2008 regular season, the lowest total of such trips since 2004. "NFL Network’s NFL Total Access 2008 Schedule Release Show sponsored by GMC, has been extended to two hours for the announcement of the National Football League’s regular season playing schedule. The show will air Tuesday, April 15 at 2:00 PM ET and will encore at 6:00 PM ET and 9:30 PM ET. NFL.com will make available the entire league and team-by-team schedules and feature show clips throughout the day. The NFL Total Access 2008 Schedule Release Show will be hosted by Fran Charles joined by analysts Jamie Dukes, Steve Mariucci, Deion Sanders, Solomon Wilcots and reporter Adam Schefter. The schedule will be announced on a week-by-week basis, highlighting all the compelling games and culminating with a countdown of the 10 most-anticipated match-ups of 2008. The special also features interviews by Rich Eisen live from the NFL Sponsor Summit with guests commenting on next season’s schedule. Fan reactions will be highlighted as e-mails are answered live on the air." In the months since the Steelers last played a great deal of attention has ben paid to the team's offensive line. More specifically, a lot of folks -- including us -- have argued that the team must take an offensive lineman, or two, in the upcoming NFL draft. Now comes word from the league that Willie Colon "earned the top figure in the NFL’s 'Performance-Based Pay' system that awards lower-salaried players for playing time." According to a press release from the league, using a formula agreed to as part of the Collective Bargaining Agreement, Mr. Colon earned an additional $309,534. Only one other member of the Steelers -- Anthony Smith ($227,536) -- was amongst the top 25 players in performance-based pay outlays. The Steelers' preseason schedule has been posted on the team's website, and it features two teams from last season's preseason -- Philadelphia and Carolina -- and two new preseason opponents, the Buffalo Bills (playing in the already-hyped game in Toronto) and Mike Tomlin's former employer, the Minnesota Vikings. The game against the Vikings, August 23, 208, is scheduled to be broadcast nationally on CBS.